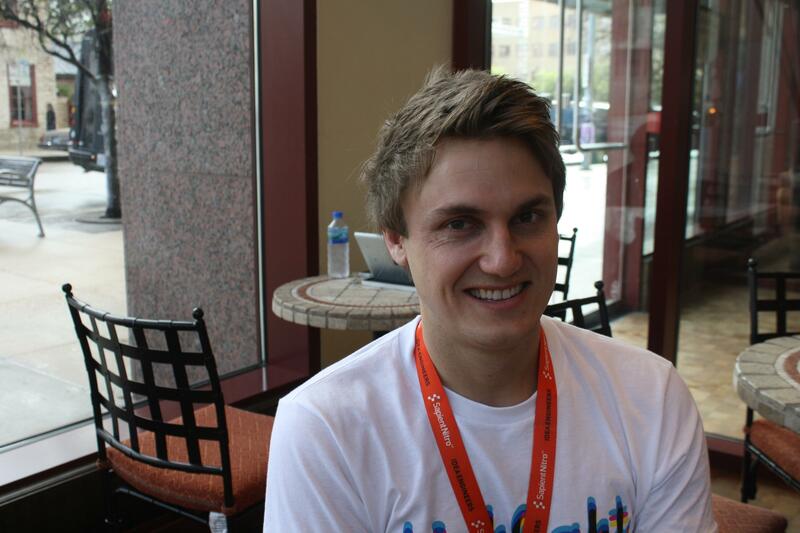 Highlight steals SXSW: Is this the first ambient reality app that works? They most certainly are. During my hour-long conversation with Davison, who formerly worked for a structured database company called Metaweb (acquired by Google in 2010), I watched the app reveal some 20+ others in the coffee shop using Highlight. Davison even pointed out someone a table away showing the app to a colleague. “That’s so awesome!” he laughs. Everywhere you go at the show, you see heads downturned toward their phones — which is nothing new for what many call “Spring Break for nerds.” We’re all furiously checking in to everything and checking out everyone there. 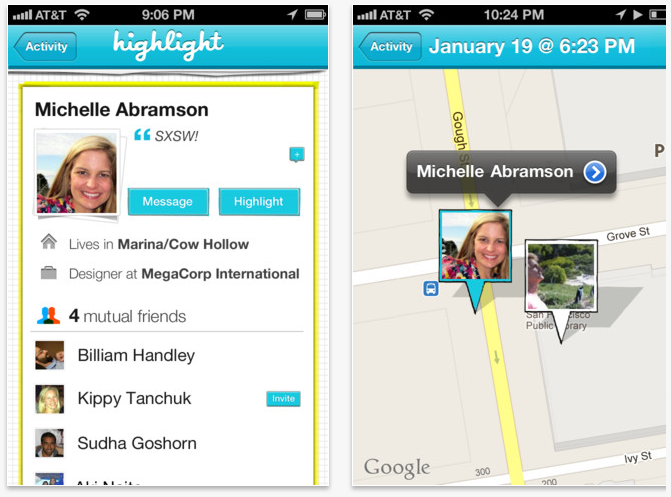 But this year, Highlight has been the location and social discovery app of choice. As is Highlight. A few updates have really fine-tuned the simple application, which uses your smartphone’s location data and your Facebook account to find people who have similar friends and interests, and happen to be in your general vicinity. “The main thing we added was ability to see who’s nearby right now,” Davison says. Before you would see someone who was nearby moments ago — it wasn’t necessarily clear if they were still near you or had just left. Now at the top of the activity you see people who are still there, and people who have left are time-stamped and fall under those currently around you. The new app also features the option to search for someone specific, the ability to follow someone on Twitter, or friend someone on Facebook immediately from within the app, and a redesigned, cleaner navigation dash. But the biggest change, appropriately, is the ability to Highlight someone: The idea is like bookmarking a person you think is interesting or want to mentally note. “We thought about that a lot,” says Davison. “Highlight is so passive, and there’s no currency — no friend adding, which is what everyone wants from a social application. In most cases, a follow is a person saying, ‘I’m consuming content generated by you. I want your content.’ And that makes sense for most social products. Davison says there was much discussion about the visibility of a Highlight. They are completely public: you see it, the highlighted person sees it, everyone who ever sees your profile sees it. Ultimately, it was decided that making this information entirely public kept the app close to it goal of connecting — not individuating — users. Color was based on actions — users taking pictures, he explains. And he’s right, there’s no passive way to use the app. Highlight is attempting to avoid this particular issue by encouraging a browsing experience and telling people to get out of the app: The welcome screen gets your info and then tells you to close the app until later. The other elephant in the room concerning Highlight is battery life. Running an app in the background is power consuming — but maybe not for long. According to Davison, every new release of Highlight improves battery life, and it should cease to be a problem in less than a year. Davison seems to have this same confidence — almost ambivalence — toward every obstacle in Highlight’s way. “It’s all do-able. All solvable,” he says about any every potential hangup. And that’s where I offered him my Highlight wish list — the ideas that you could message everyone using the app within 900 square feet simple questions like “What Wi-Fi network is working best for you?” or “Is anyone going uptown and want to share a cab?” (these are clearly SXSW issues) even earned me a high five. I also complained about not being able to edit my photo, which didn’t format correctly, and he says facial recognition technology or a photo edit tool could be implemented to fix this. The real test comes now. We’re all leaving SXSW, and with it the company of fellow app nerds among us. But if Highlight can use this spotlight and keep user engagement, then we could be poised for the next big step in the social evolution.